Untitled 2016, IP3, Translucent concrete, retreived tropical wood, votive candle residue. 99,5 x 61 x 43,5 cm. Special thanks to: Dr. Qingliang Yu and Xu Gao M.Sc. from the chair Building Materials (Prof. Dr.Ir. H.J.H. Brouwers) at the TUe, Center for Visual Arts Rotterdam and Tomaello b.v. Photo W. Vermaase. Collection: Technical University Eindhoven. Untitled 2013 - 2014, ecological concrete, Aquadyne (recycled plastics), consumer waste, reclaimed river bricks. 726 x 100 x 100 cm. Commissioned by Rabobank Alblasserwaard Noord en Oost. Special thanks to: Prof.Dr.Ir. H.J.H. Brouwers & Prof.Dr.Ir. T.A.M. Salet of the Eindhoven University of Technology, for their support during the developing process. Photo:J.E.Visser. Link . Untitled (Roteb Eco Monument) 2010-2011, Staircase, rubble, mortar, aluminium production waste, 90 bicycle wrecks, 11 m3 used wrapping foil, Aquadyne (recycled plastics), solar panels, fertilizer system, grass. 455x402x402 cm. Special thanks to: Prof.Dr. W. Sinke, Dr. N. Reich, Utrecht University, Erik Eikelboom Msc., Dir. R&D Centrosolar group AG, Prof.Dr.Ir. P.C. Struik, Wageningen University & Frans van der Sanden, Rogroen, Rotterdam. Photo: J.E. Visser. 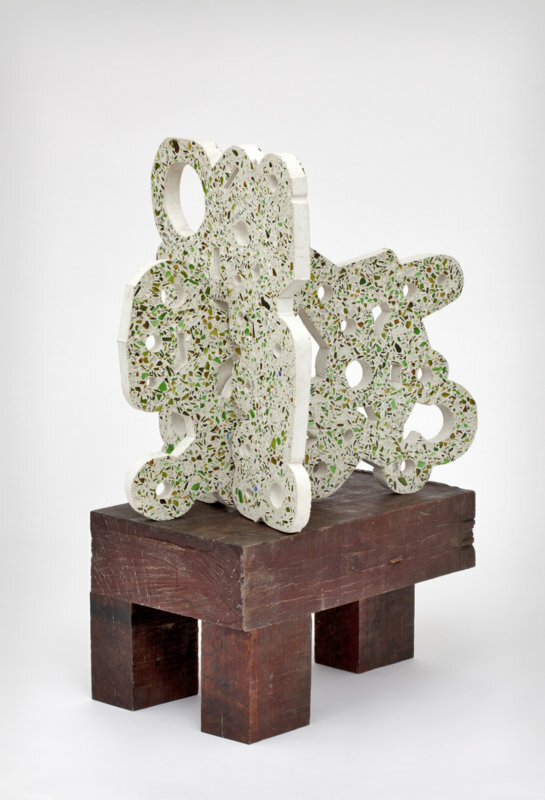 "Aquadyne Sculpture", 2008, Litter and Aquadyne (recycled plastics), 200 x 240 x 170 cm. Photographed here at the Verbeke Foundation, Belgium, by L. de Latter. Special thanks to: Dr. Oliver Heidrich, Newcastle University. UK. Ed & John Gaskarth, Econoplas Ltd., Scarborough, UK., Ecoplanet BV. NL.